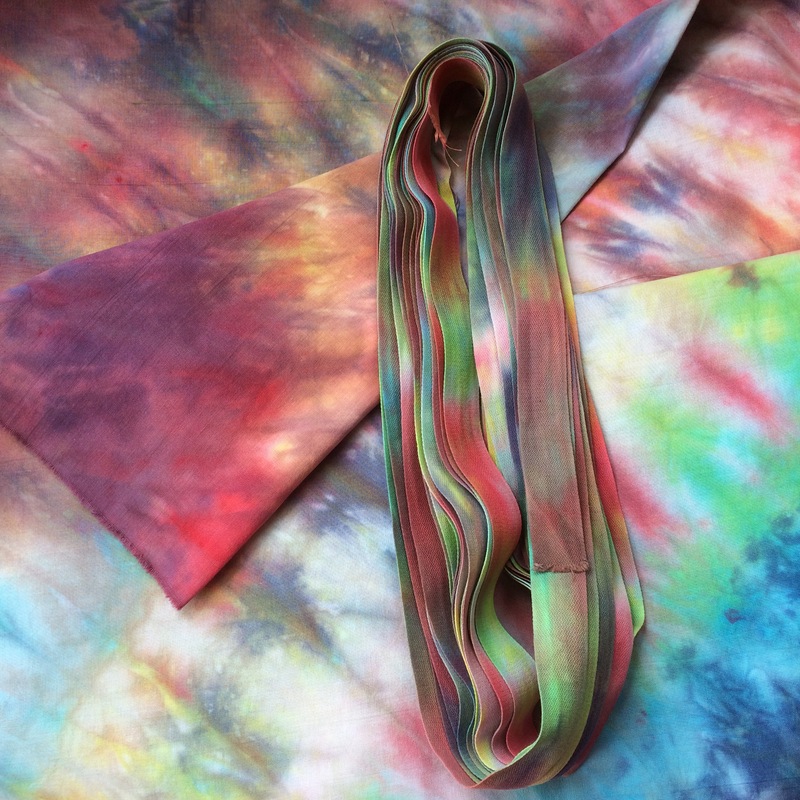 All the workshops are done, so now it’s time to transform piles of print and spiral dyed fabric into a brilliant banner. I’ve dyed the background fabric and the ribbon streamers. All the scroll text is cut out. I cut the letters with bondaweb so they’ll stay in position when I stitch them. 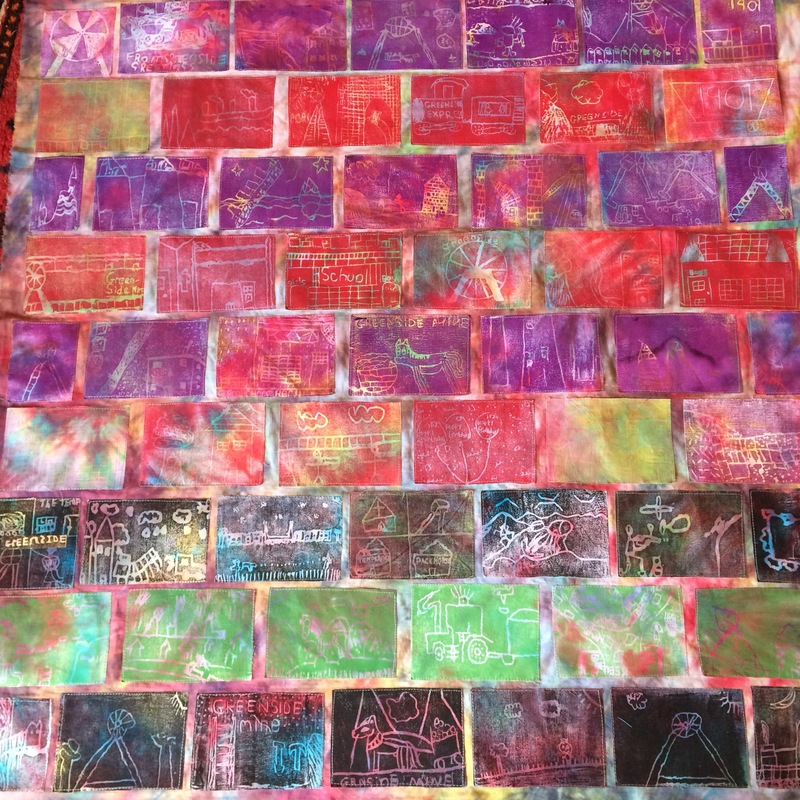 The back panel has had its ‘first fix’ with postcard prints from years 3-6. I’ve used a brick wall pattern with stripes of different colours to echo the stripey brickwork in Greenside miners’ cottages. This will make the back of the banner visually interesting as the children march along the street. 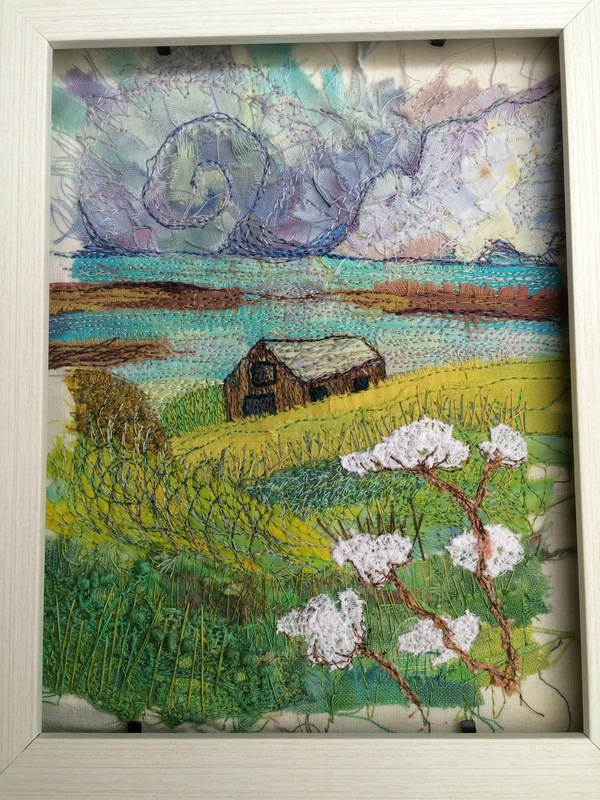 This entry was posted in commission, community project, craft workshops, Pit Village Colliery, Uncategorized and tagged block printing, children's workshops, spiral dyeing, textile art, workshop on July 5, 2016 by donnacheshiretextiles. screen made from old frame and net curtain! 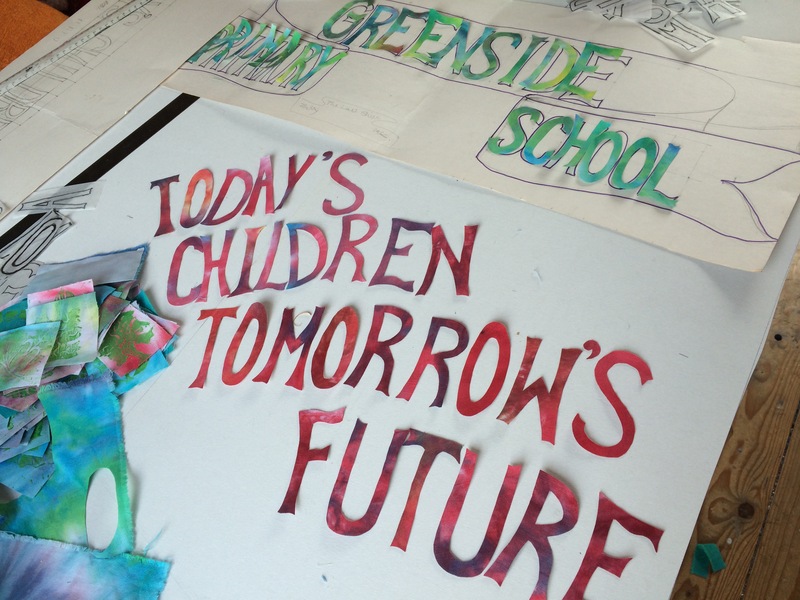 For the next stage of ‘The Last Shift’ banner project, I’m going to ask the children to screen print dates from the era that Greenside Colliery was open. 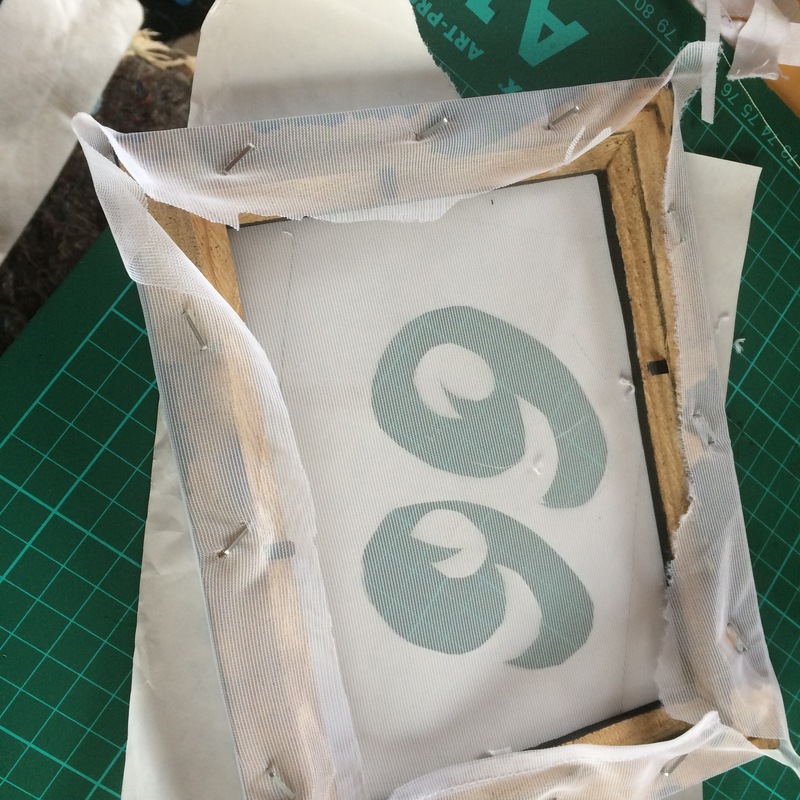 Screen printing can be very technical and complex…or it can be an improvisation challenge- we’re going for the latter! 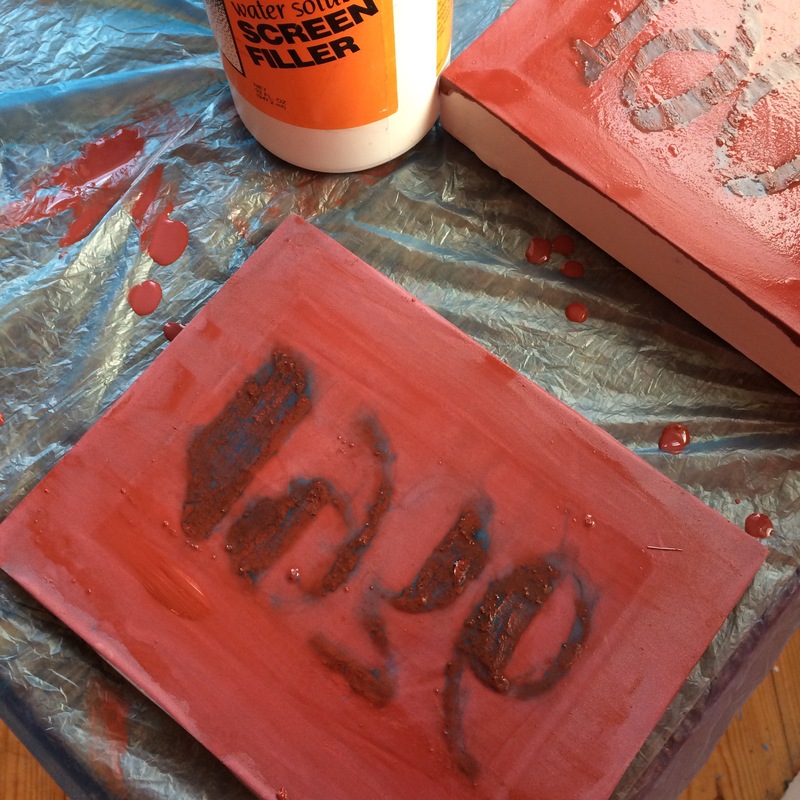 I’m using Speedball screen painting fluids to make the screens. 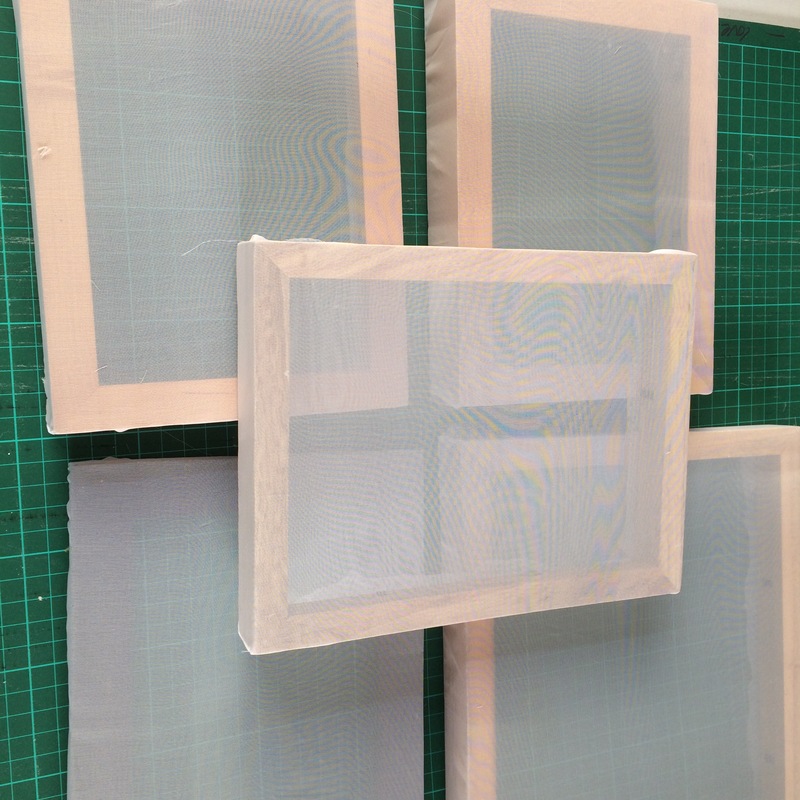 I tested out the nets using stencils made from kitchen paper- the plasticised surface makes it stick to the screen so it’s a great temporary stencil. 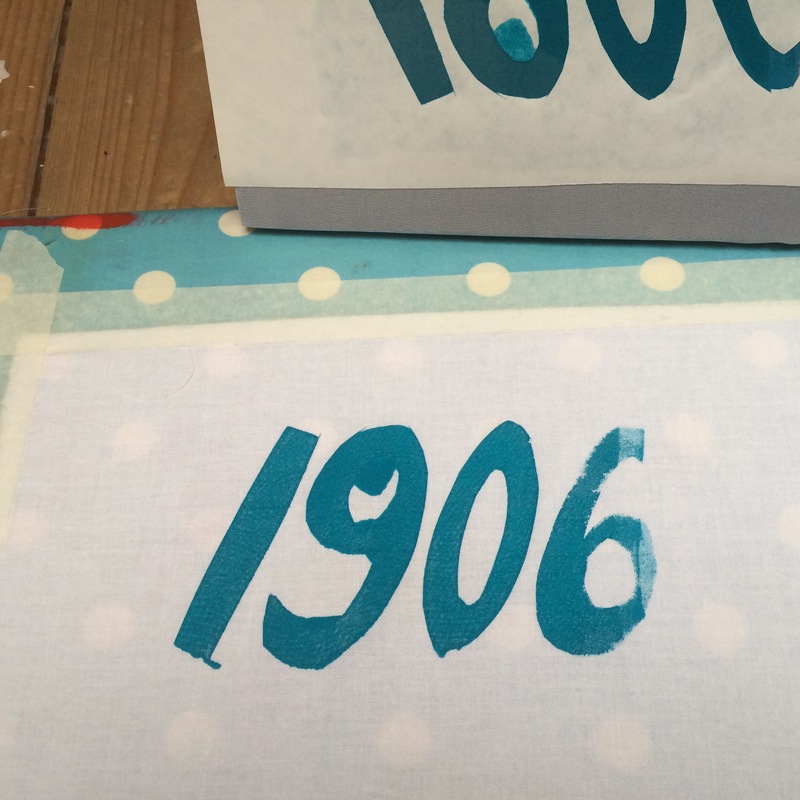 You can cut or tear the kitchen paper to make stencils but they’ll only last for a couple of prints. 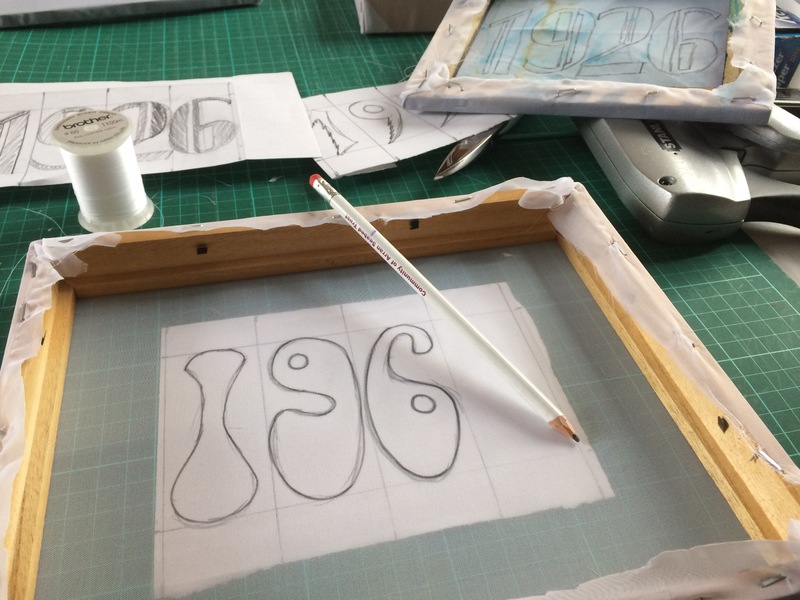 With the speedball process – blue screen drawing fluid is used to draw the design onto the screen. 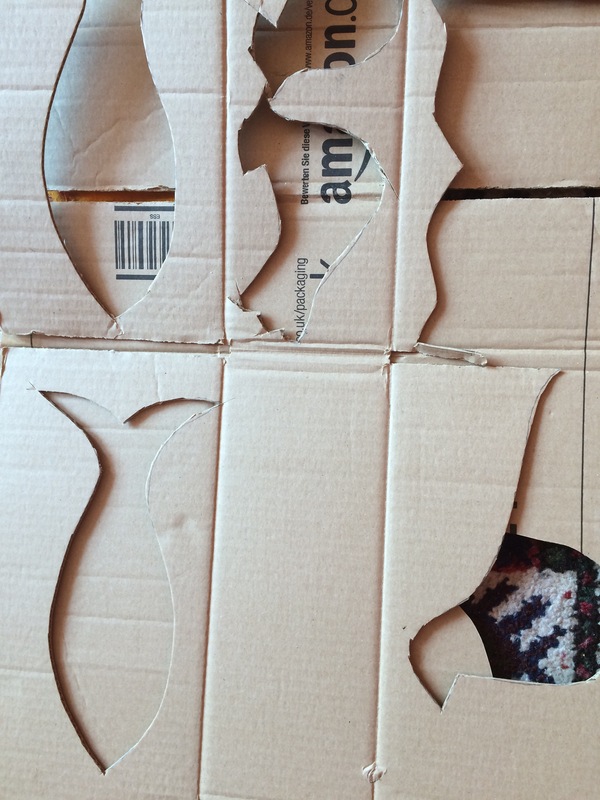 First I traced the design onto the screen. 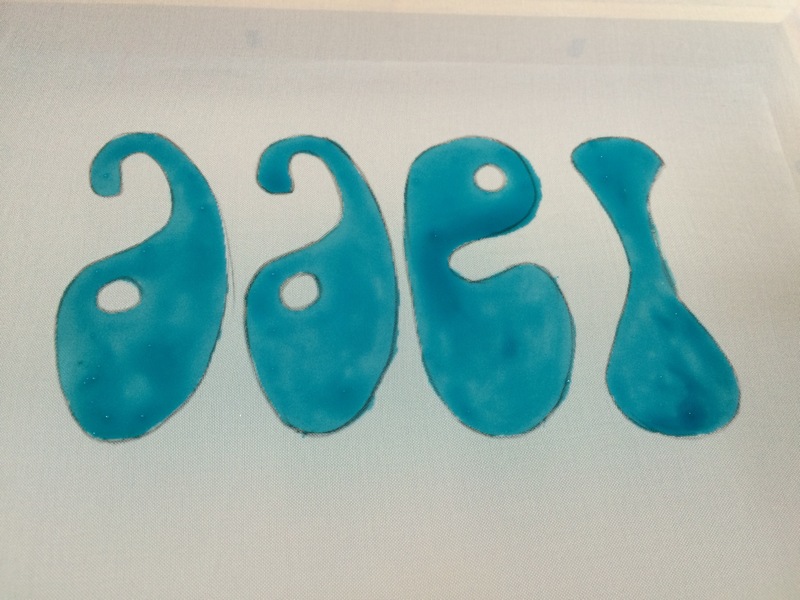 Then I painted it out with the blue drawing fluid. This needs to dry completely. Then the screen filler is spread over the entire surface of the screen and left to dry. 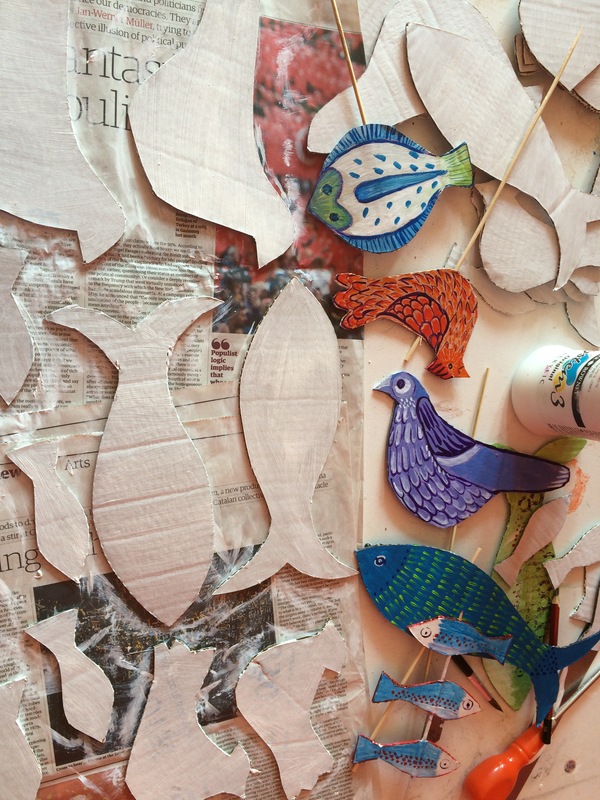 This entry was posted in artwork, community project, craft workshops, Pit Village Colliery, Uncategorized and tagged craft workshop, kids workshop, mining banner, screen printing on June 22, 2016 by donnacheshiretextiles.